To encourage the sharing of value - added publications such as best practices, success stories or customer testimonials... Incenteev has created the "Post and Win" feature that allows you to distinguish these value-added publications from standard publications. You structure them as you want and reward their authors. That's right, it can be gamified: post authors can receive rewards for their contribution. We recommend contacting your customer support manager at support@incenteev.com for a full demo. How does it display ? You can easily spot the "Post and Win" in the newsfeed . The post has structure, a status and a nice ribbon which indicates the topic (dataset) to which it belongs. Find out more about status. Some "Post and Win" require manual validation if you chose so. 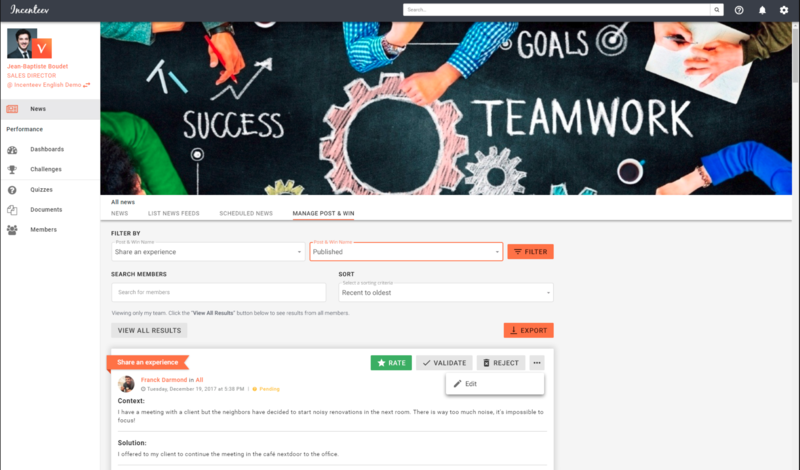 In the management section on the "Post and Win" you can filter the "Post and Win" either by topic or by status. The "pending" status is the one requiring validation. You can validate, reject and delete, but also rate (if enabled) a "Post and Win". Validating a "Post and Win" means that you accept it as a legitimate contribution based on which you can reward its author. Managers will view their team members "Post and Win" first. How to use it in a challenge or dashboard ? If you choose to reward the "Post and Win" authors you would need to create an indicator in a Dashboard or a Challenge. We recommend to contact your customer support manager at support@incenteev.com for a full demo.